Around the suburbs of Buffalo, N.Y., Bill Pavone is something of a celebrity. He's better known as Chilly Billy, which is also the name of his ice-cream truck. The freezers in the back hold no fewer that 32 varieties of packaged ice cream. Some of them (like the chocolate chip cookie sandwich) are very popular with the kids. But when it comes to the graybeards, there's a particular favorite. "The older people enjoy the classics," Pavone said, "so they ask for the vanilla with the chocolate around it." In other words, they ask for Good Humor's original ice cream on a stick. First called the Good Humor Sucker, the treat was born in 1920 when a Youngstown, Ohio, confectioner named Harry Burt developed a way to put a hard chocolate shell on an bar of vanilla ice cream. When the chocolate melted from the heat of customers' hands, Burt's son suggested he insert a wooden stick into the bar for people to hold. It was "a new, clean, convenient way to eat ice cream," Burt said—so good that it improved your mood and, thus, the Good Humor name was born. As the story goes, Burt got a patent on his ice-cream bar only after visiting the U.S. Patent Office in 1923 with plenty of samples. A gifted marketer, Burt began selling his bars from a fleet of trucks driven by men in white uniforms and black bow ties. 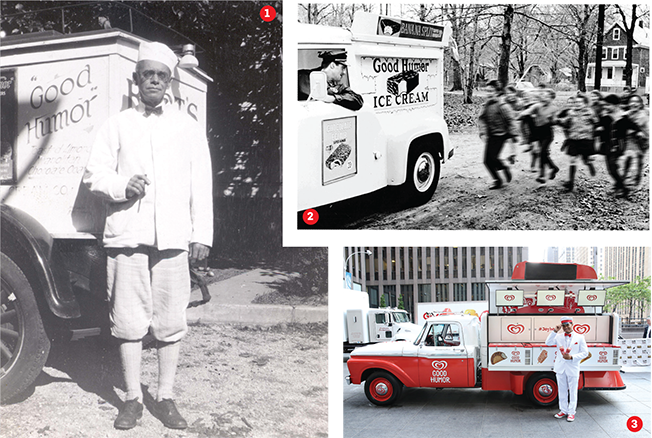 In the ensuing years, the trucks—and the ice cream—became an American institution, an empire built on the spare change that parents fished out of their pockets for their kids. The tradition ended in 1976 after CPG giant Unilever (which purchased Good Humor in 1961) decided that the future of ice cream lay in supermarket freezer cases. Granted, filling up your shopping cart at Walmart is not as romantic as waiting for the Good Humor man. But fond memories have kept the bars popular. "The appeal of the Good Humor bar is the classic combination of flavors, as well as the nostalgia people feel for their youth in the summertime," said Leann Rich of Ohio's Mahoning Valley Historical Society, which keeps Burt's legacy alive. More recently, slipping sales led Good Humor to bring the trucks back. The "Welcome to Joyhood" summer campaign now sends a small fleet—restored classics distributing free samples—around the mid-Atlantic. Last year, one distributor in New York's Nassau County tricked out a truck in psychedelic colors with speakers blaring tracks from Lady Gaga and Beyoncé. "It's just an old-fashioned idea that needs to be revitalized," he said. Maybe. But in Chilly Billy's experience, the bars do a pretty good job of selling themselves. "They're tasty without being over the top," he said. "This is the least stressful job I've ever had in my life." This story first appeared in the June 20, 2016 issue of Adweek magazine.